Synthetic Distribution L.L.C. Distributor of Amsoil synthetic lubricants, oil and filters. Retail and commercial fleet account discounts. We often receive requests for additional information about products or certain types of applications. Most of the information contained on the www.syntheticdistribution.com web site is taken from published AMSOIL brochures, data sheets, newsletter articles and the AMSOIL Action News monthly magazine available to all AMSOIL Preferred Customers and Dealers. Should you request an AMSOIL Retail Catalog, submit an on-line application to be a Preferred Customer, or request an Application to be an AMSOIL Dealer, we will send you a Compact Disc (CD) with over 150 application and product brochures, technical data sheets, filter system installation instructions, and "How to . 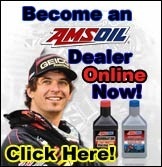 . ." guides on AMSOIL programs and opportunities. The following sample AMSOIL brochures will give you an idea of the information available on the CD. Also check out the Technical Information page that lists AMSOIL Data Sheets also available on the CD. These brochures are presented here (and on the CD) in Adobe Acrobat Portable Document Format (.pdf) files which can be read with the Adobe Acrobat Reader program. You must have the free Adobe Reader program installed on your computer to view the documents. Download the free Adobe Reader program. ATF Low Viscosity DEXRON VI, MERCON LV, SP or Toyota WS.